Thumbnails are the "little" versions of images that Windows Explorer displays in some folder views. You can see what an image is, in miniature, presumably so you can choose the right one for whatever it is you're doing. Rather than create the thumbnail each time Windows Explorer displays the contents of a folder, it creates the thumbnails once, and then save them using thumbs.db. If the original file changes, the thumbnail would be updated, but other than that Windows Explorer doesn't need to recreate the thumbnail again, and can display the folder view more quickly the next time you take a look. "Fortunately you can turn it off with a simple setting." 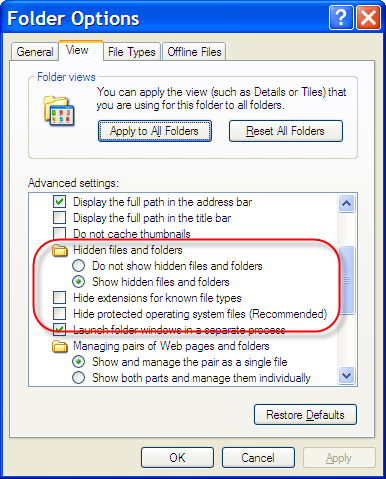 I make sure to set Show hidden files and folders, as well as Hide extensions for known file types and Hide protected operating system files. The later will give you a warning, but I prefer to see everything. Thumbs.db is a nice little optimization, but if like me you don't use the icon or image view in Windows Explorer, it's just not that useful. Fortunately you can turn it off with a simple setting. Just check Do not cache thumbnails, and no new thumbs.db files should be created. Where is Windows Explorer? Windows Explorer is everywhere - yet finding Windows Explorer on the Start Menu is actually fairly difficult. 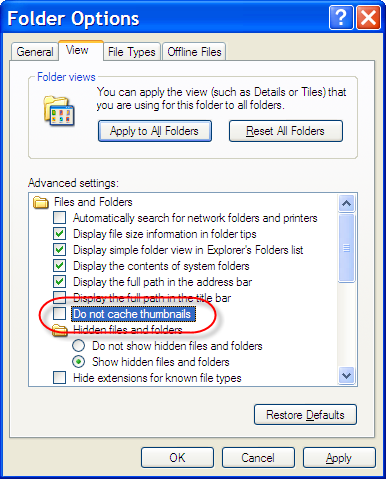 We look at where Windows Explorer is, and some of the many other ways you can get to it. Thanks...i was wondering what exactly it was.. In Vista there isn't an option to never create thumbs. So I clicked don't show them but I don't think that's right. I have the opposite problem. The Do Not Cache box is NOT checked, but the thumbs.db are still not being created. Why not? I want to see thumbnails, but they do not appear. I was moving a folder with many jpegs from one drive to another. The jpegs were all arranged alphabetically. When it came to the 'T's, the thumbs.db files started moving, then I got an error message. All the jpegs up to the T's moved over to the new drive and when I access the new folder, I can see thumbnails. All the jpegs after the T are stuck in the old drive, and when I open the old folder, I cannot see the thumbnails. I tried to more the remaining jepegs over, but the thumbs.db files start moving and I get the error message again. What can I do? Will deleting the thumbs.db from the old folder help? Also why can I not see thumbnails of the jpegs remaining in the old folder? THANKS LEO: WORKED LIKE A CHARM! Was cleaning my picture folder and this file had over 9MB so I was trying to get rid of the bigger file like this. Yet windows kept telling me it was being used by a program, but, being windows it does not tell you which one! So trying to figure out and close the thing was driving me nuts. Great job Chief! I was trying to delete an old folder that had some pictures in it. When I went to delete it, Windows would not let me delete the Thumbs.db file. I am able to delete everything in the folder (word files and picture files) but cannot delete the Thumbs.db file. Windows keeps telling me that it cannot delete Thumbs.db files and that another program or person is using it. Only there are no other programs open and no other people logged on. I can see the hidden file, but Windows will not let me delete it. I'm stumped, can you help me? Thanks! I still get a message that the Thumbs.db cannot be deleted, nor moved, because it is "being used by another program." It isn't... with the exception, possibly, of an unseen piece of the Windows Explorer program that might be snuggled in some cache someplace. This is something new to my environment as I have heretofore been able to delete folders at will. It may be a firewall thing, I'm not sure. Leo, I will grant that the checkbox "Do not cache Thumbnails" was there when you wrote this article, but several people (and now myself) have observed that it is no longer there. Please check this out and update the article, if possible? Still there for me with XP Pro SP3. There must be some other criteria by which Windows does or does not include it. Lovely. Can I get the file back? How to do that? "The file 'Thumbs.db' is a system file. If you remove it, your computer or one of your programs may no longer work correctly. Are you sure you want to delete it?" From reading your webpage it doesn't sound like a big deal to delete the thumbs.db files, yet this error message has me frozen. What if I bring back my pictures and find that something has been screwed up & they can't be read, anymore? I have one or more folders with only a Thumbs.db file in them that will not delete using the instructions provided here. Note they appear with a capital T. The folder name cannot be modified or the folder deleted. It says being used by another person or program. Please comment or help. Thanks. Hey, where did thumbs.db come from I am just now seeing it on my computer desktop. I have never seen it before now while I was trying to see why I can't close my yahoo.messenger. Don't remember opening any pitures recently. What is thumbs.db. Is it messing with my computer? Hi Leo, I wonder if you can help me since I can't seem to locate answers elsewhere. While trying to view certain video files on my harddrives, I get a Windows Explorer error message saying that a problem has occurred and Explorer needs to shut down. From what I have read, I'm pretty sure it relates to thumbs.db files. I copied videos from one harddrive to another and deleted the original ones to consolidate all videos. Some folders are unaffected and can still be viewed as thumbnails. I tried deleting the thumbs.db files and then letting XP recreate them the next time I chose to view as thumbnails, but to no avail. I told Windows not to cache thumbnails and searched for and deleted any thumbs.db files on my system but still have the same problem. Also, certain videos, when I try to play them, instantly give me the above-mentioned error message even if the folder is set to be viewed as tiles, lists, etc. But most are fine when the view is set to anything other than thumbnails. Originally, there was one subfolder that I had this problem with only. At the time, I didn't know that it was related to the view. I tried to copy the subfolder to a different folder and in the middle of the transfer I got the error message. Now both folders have the same problem. When I try to view these folders as thumbnails, thumbnails start to be produced but after a few seconds, the error message appears and Explorer shuts down. Thanks in advance. K.C. 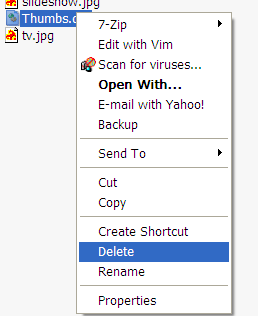 It's a free program that allows you to end the thread and delete the file. Note: Use with caution and only delete the files you know are safe to. Will it give any bad effect to our systems? I mean, do I face any kind of problem if I don't delete Thumbs.db from my PC? Please suggest. It's harmless. I ignore it. Thanks for the "Hide protected operating system files" tip - that's what caught me out, as with that a search won't find it. Leo--will turning off thumbs.db prevent thumbnail views from being generated? Or, will it allow creation of the thumb, temporarily and then discard it when the folder is closed? Or, to restore thumbnail views, would I need to uncheck the caching mode in settings per above? thanks! How to do that in windows 7 I dont see an option "" Do not catche thumnails""
It sometimes can be frustrating when Microsoft keeps changing things. In Windows 7, open the Control Panel then go to Folder options. Next check the box, Always show icons, never thumbnails. It quickly removed my thumbs.db file that said it couldn't be deleted because it was "in use by another program." It was also free. Switch Page View in Explorer to "Content" view and in most cases you can Delete, Rename and Move. brother nice sharing. keep it up. Windows Explorer is sometimes called "My Computer." Easiest way to get to it is to hold the Windows key down and type e. It'll pop right up. Thank you for walking us through this process! I ran into one problem. Under folder options, and view, I didn't have an option for 'do not cache'. I had one that sounded like it might be similar, "display file icon on thumbnails" but I wasn't sure. Is this the same thing? Those dang db files show up in every doc and photo file I have, it's completely annoying. Thank you again! Thumbs.db is a file which holds thumbnail versions of the pictures in that folder. If you delete it, nothing serious will happen. It is safe to delete. In fact, the next time someone opens that folder Windows will recreate that thumbs.db file. Just be careful. Not all files are as safe to delete as that one.